Help National Black Republicans RAIN on Obama’s Parade!! (2008) | the "silent" majority no more! HELP RAIN ON OBAMA’S PARADE! where the Democratic Party is having their national convention. “I Have a Dream” inspirational civil rights speech. History shows that Dr. King was a minister who embraced the traditional values that made our country great. Obama has the most liberal voting record in the US Senate. Join the fun. Donate now to our Denver billboard campaign and help make history. NBRA and mail to: 5824 Bee Ridge Road, #419, Sarasota, FL 34233. 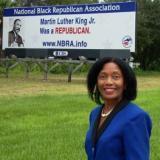 Below is one of our MLK was a Republican billboards. It is locaced in Sarasota County, Florida, along US-41 near Venice, FL.